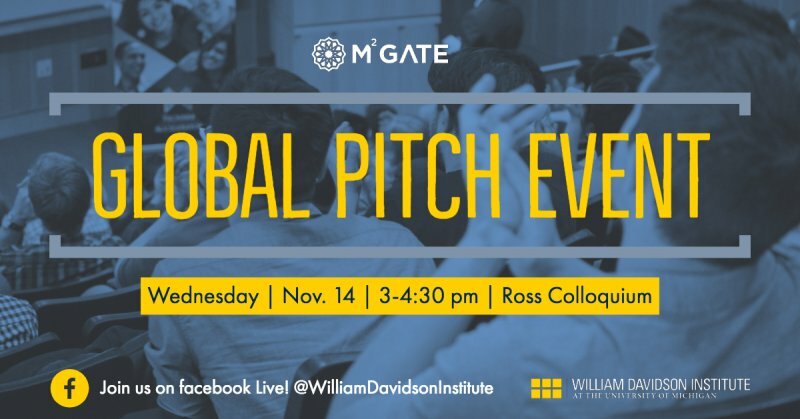 Join us in person or through Facebook Live for a Global Pitch Competition that caps off the MENA-Michigan Initiative for Global Action Through Entrepreneurship (M²GATE) program that has involved more than 500 students. For the last 18 months, the William Davidson Institute at the University of Michigan has managed a virtual exchange program that paired University of Michigan, Eastern Michigan University and Wayne State University undergrads with fellow students in Egypt, Tunisia, Libya and Morocco. Working together online, via chat and through streaming video workshops, each team came up with a business concept designed to tackle a social or environmental challenge in the MENA region - from youth unemployment to water access to trash pickup to soft skills development - just to name a few examples. 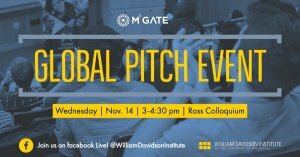 On Wednesday, Nov. 14, three winning teams made of both U-M and MENA students, will gather at U-M’s Ross School of Business to present their ideas to judges as part of the Global Pitch Competition. In addition to U-M students, six students from Egypt, three from Tunisia and three from Morocco will compete in the event after meeting one another in person for the first time. The program, known as the MENA-Michigan Initiative for Global Action Through Entrepreneurship (M²GATE) is funded the U.S. State Department and the Stevens Initiative, whose namesake is the late Christopher Stevens, the U.S. ambassador killed in 2012 attack in Benghazi, Libya.